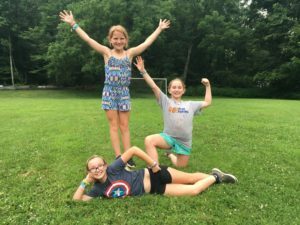 It’s sometimes difficult to describe life at camp, to convey how the girls at Rockbrook feel about the experience overall. 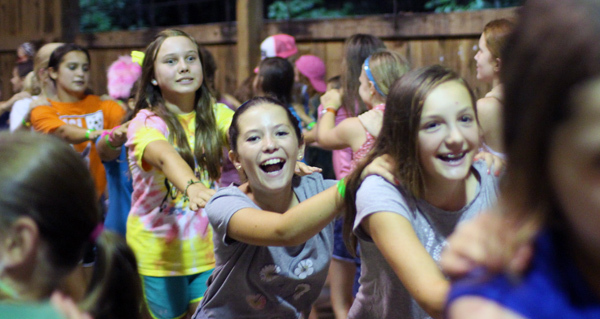 They’ll tell you they are having fun, or they’ll say things like, “I love camp!” or “This is great!” But what are some of the emotions that go along with it? 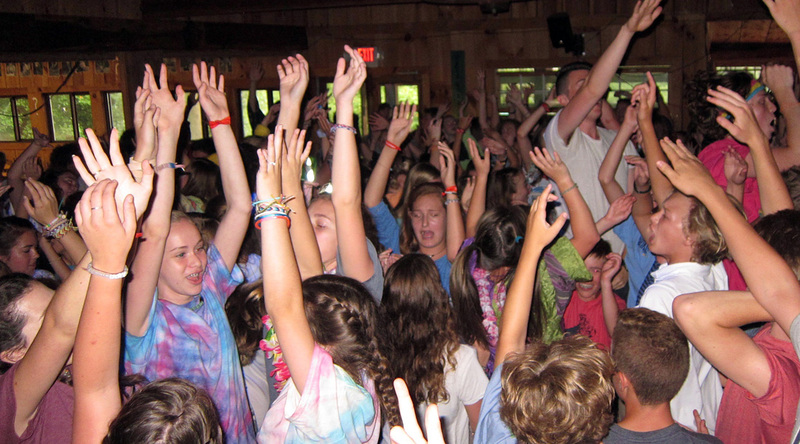 What are the campers feeling while they’re here? Seeing all the smiles and hearing so much laughter, “happiness” is the first feeling to notice. 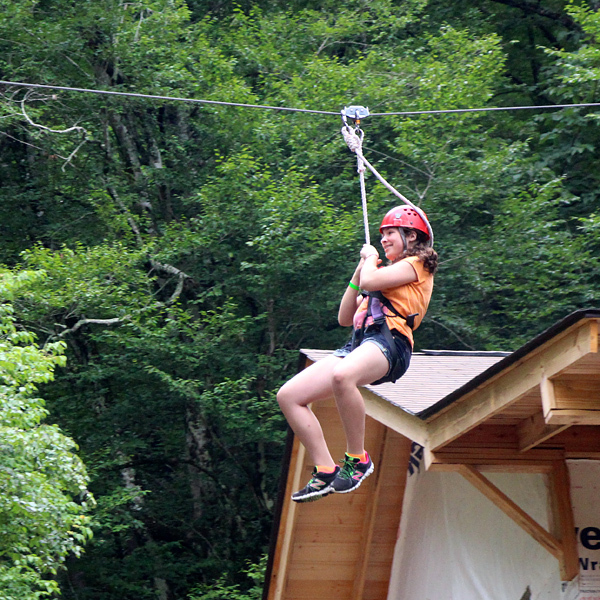 There’s obviously so much joy and exuberance percolating up throughout the day at camp— screaming with delight while flying by on the zip line, laughing so hard at a skit you’re rolling around on the floor, smiling from the string of friendly greetings that seems to follow you everywhere. 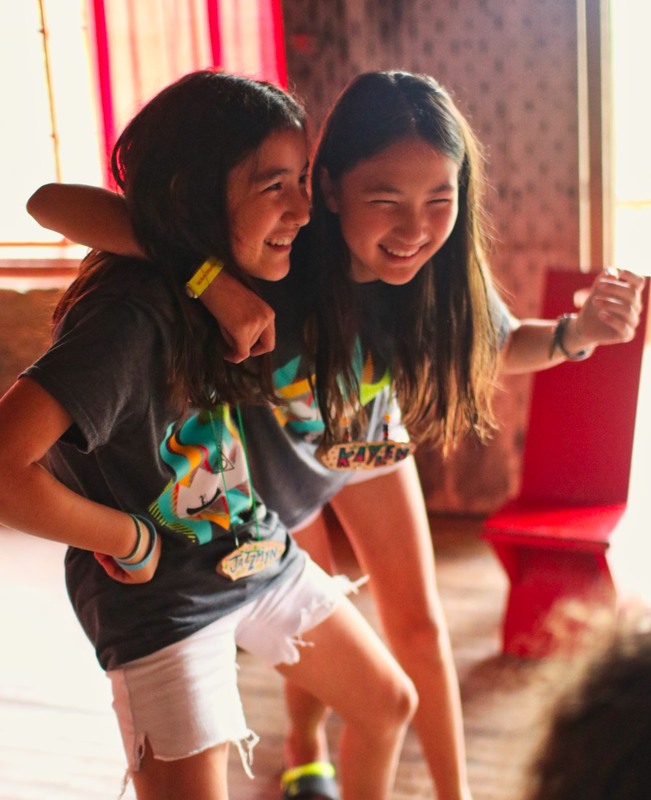 Yes, the girls here are happy, and we could say at times “excited,” “thrilled,” or “elated.” Of course, there are challenging emotions now and then too, bugs that bother. A camper might feel frustrated, for example when she misses the target in archery, or even angry when there’s a disagreement with another girl in her cabin. These are all common and expected emotional responses to life in the camp community. 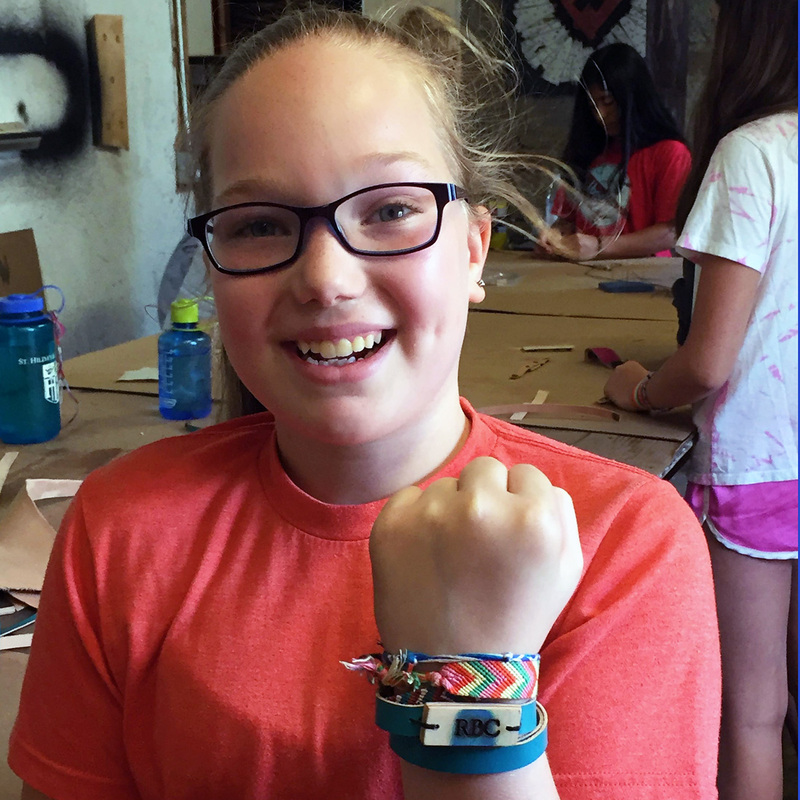 There’s another word, perhaps a little surprising, that describes a general feeling at camp: unburdened. 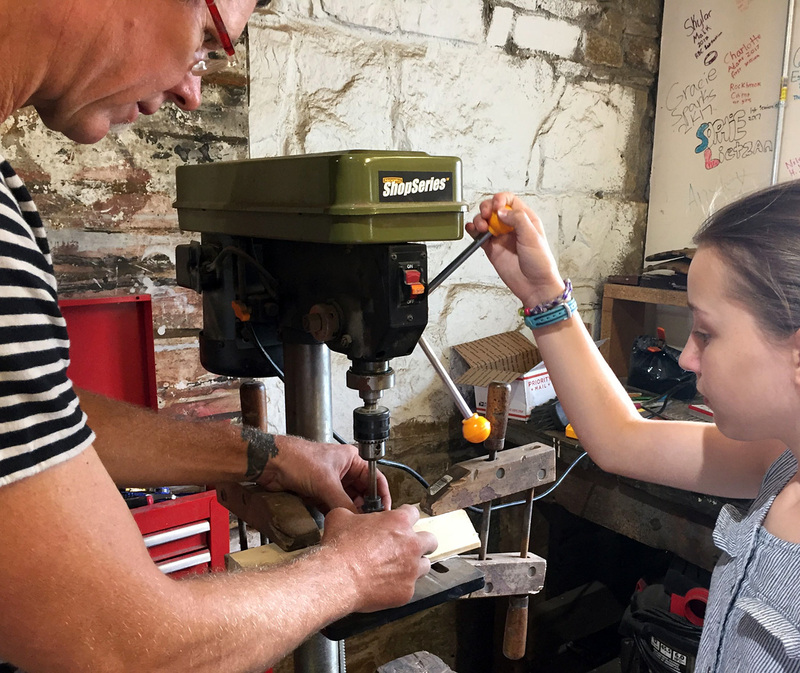 It’s a feeling of freedom, in many ways, a welcome relief from the pressures, limitations, and expectations kids bend to throughout their ordinary lives. 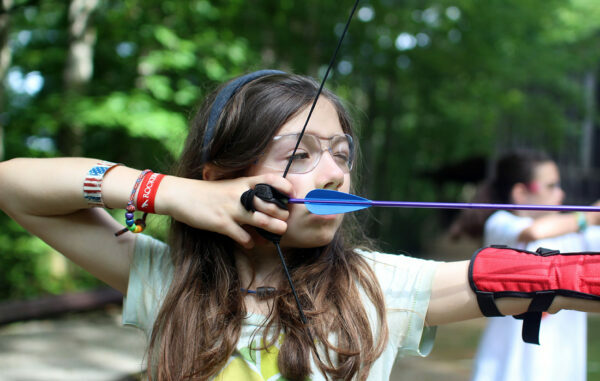 Put differently, I think modern life is burdensome for kids in specific ways that camp life addresses. 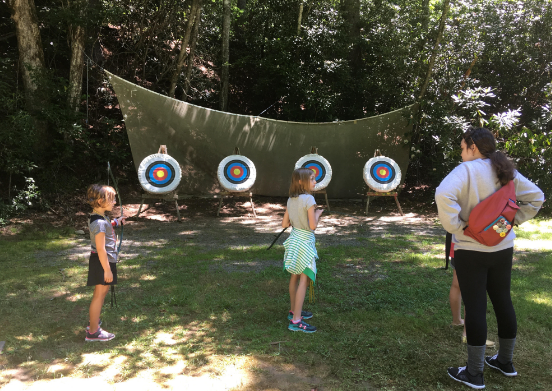 How we live at Rockbrook— mostly outside, free from technology, as members of an accepting community, active and engaged, but with free time to explore the world and who we truly are as individuals —is in this way unburdening. Think about what’s happening at camp, and how it differs from your daughter’s ordinary experience. 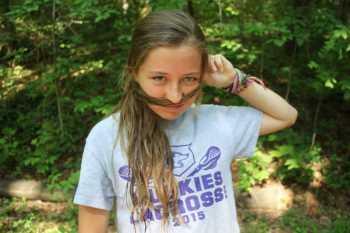 At camp, we ditch technology. Here, instead of diminishing, and flattening experience, our communications are unfiltered, personal, and face to real face. We have plenty of free time throughout the day to play, explore, create and rest. 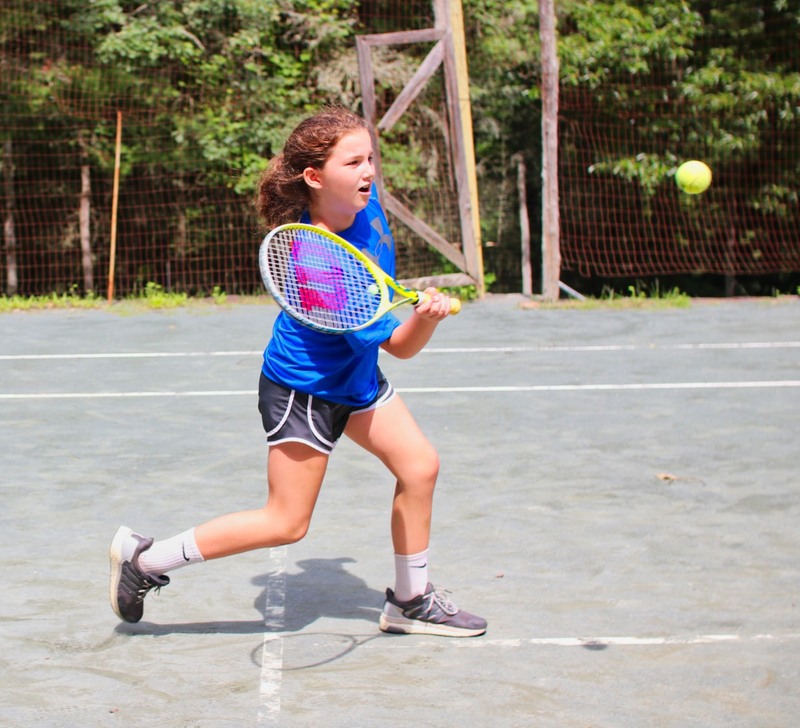 Here at camp, our schedule is always built with flexibility and openness. 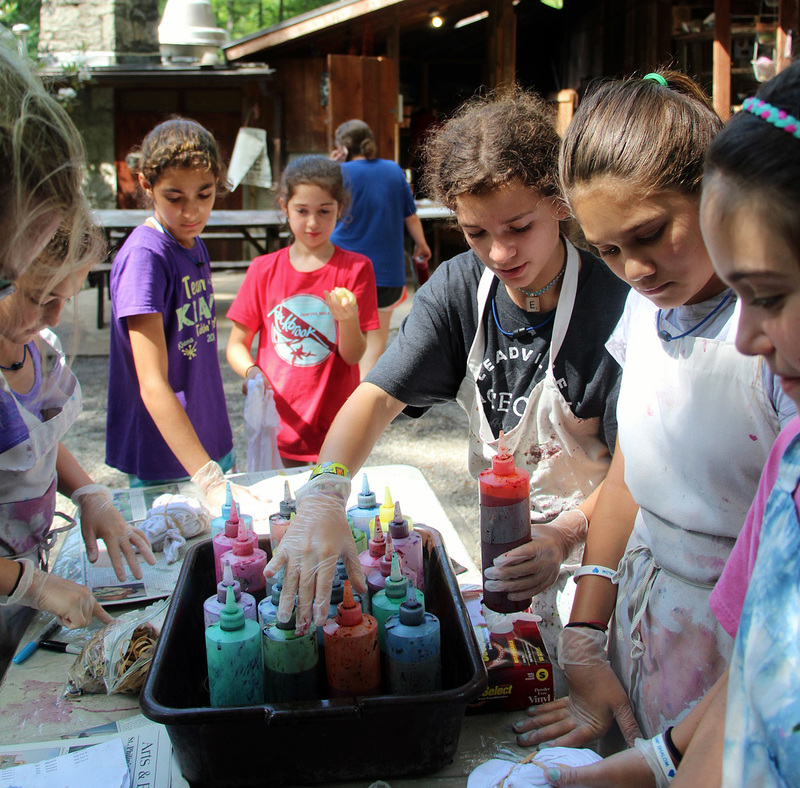 Camp lets us avoid social pressures to “be” (look and act) a certain way. Here, girls can be who they really are, their authentic selves, because they feel genuinely accepted and included no matter what. 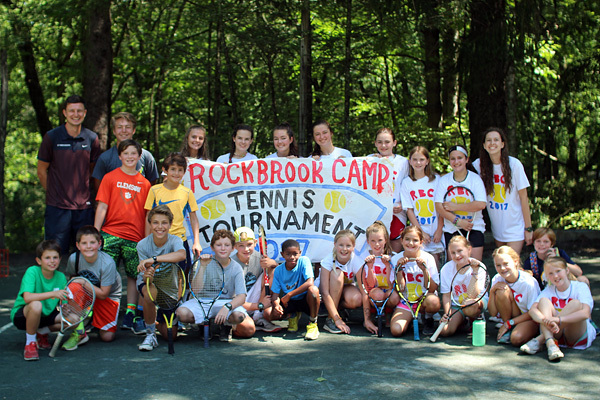 At Rockbrook, we put aside competition and find ways to cooperate and support one another. 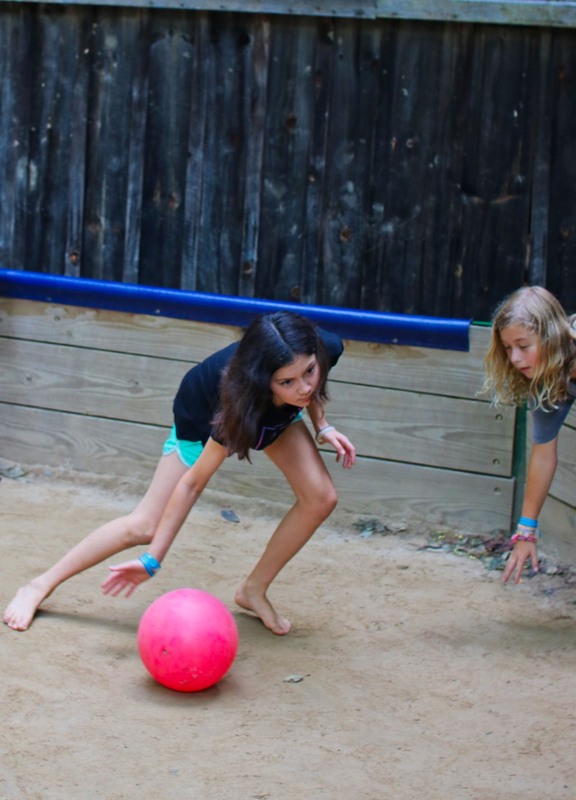 Games are for the intrinsic fun of it rather than to determine a winner. We’re outside most of the day, closer to the wonders of nature, and free from the constraints of regular automobile travel and being indoors. 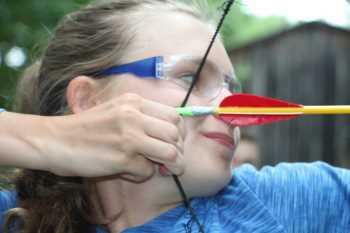 Camp is also full of action. We’re doing things all day long, not sitting still at a desk or being passively entertained. And we’re never alone. Camp life is immersed in kindness and caring, inseparable from the positive relationships (so many friends!) that comprise our community. 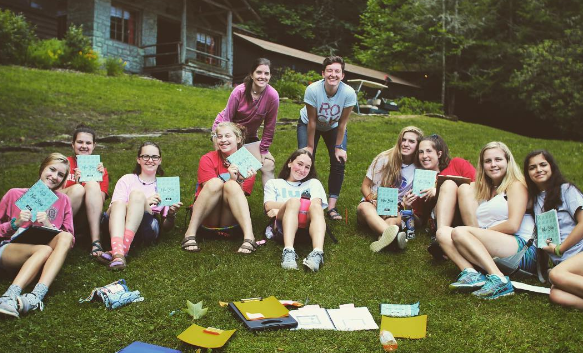 The girls at Rockbrook may not use the word, but they certainly feel it. 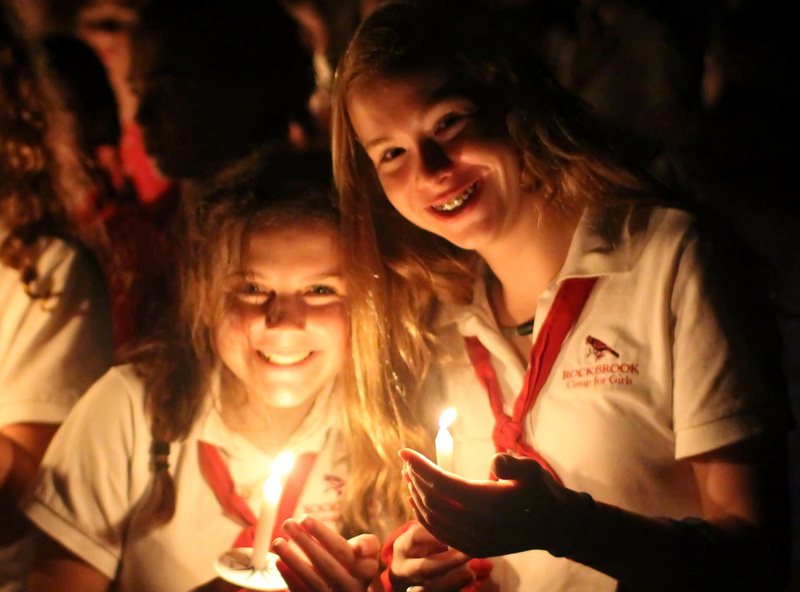 I asked a few campers today if they felt “unburdened” in any way at camp and they all enthusiastically said, “Yes!” That feeling of “aahh, I feel good” could be the loosening of pressures, lifting the weight of competition, dissolving the cloudy film cast by technology, the opening of the self usually kept under wraps. 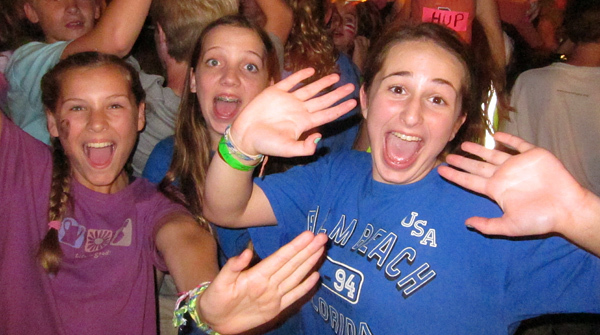 Life at camp elicits these feelings, and it does feel really good. In fact, we might say it’s the perfect context for a really great time. Let’s just add this notion of unburdening to the many reasons why girls love camp. OK? 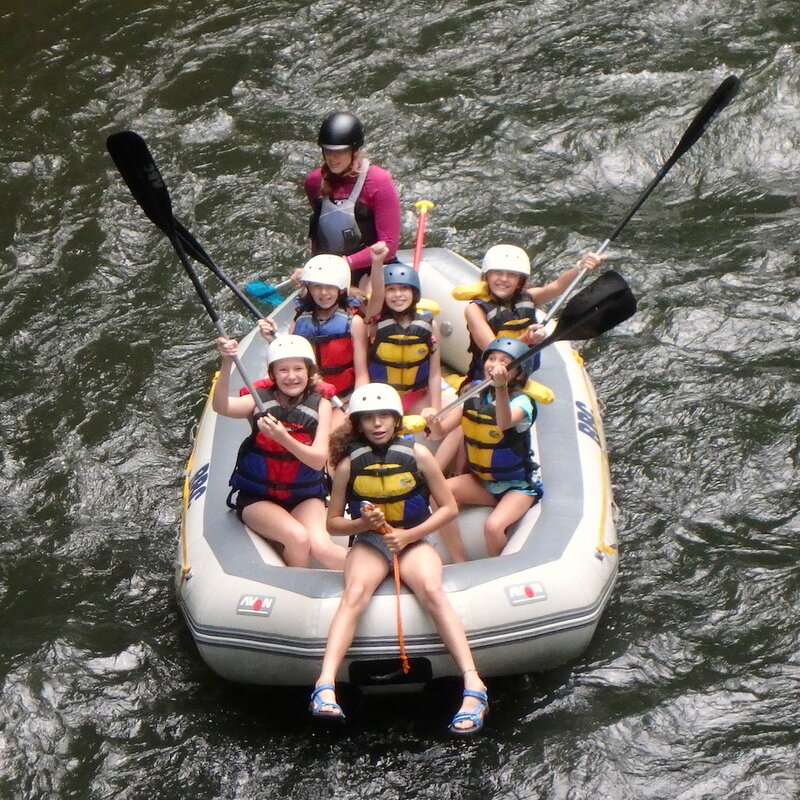 At Rockbrook, every girl who has completed the 5th grade or older (our “Middlers” and “Seniors”) can go whitewater rafting on the Nantahala River. 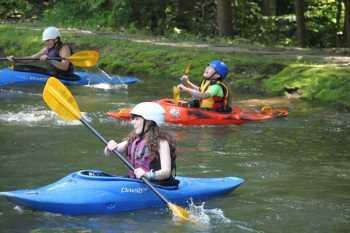 For many years now, since the early 1980s, we simply ask the girls “Who wants to go rafting! ?” There’s no extra charge, no pressure to go, and the girls decide for themselves if they are interested, but without a doubt, rafting has become the most popular outdoor adventure trip we offer. 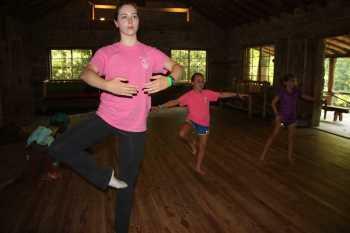 I’d say 95% of the girls old enough to go, do go, and go every year they come to camp. 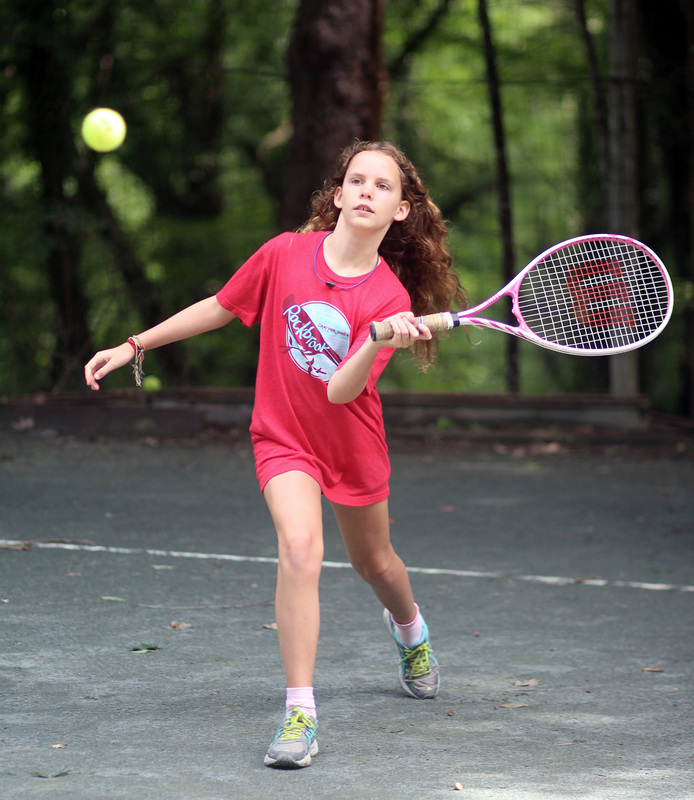 In this way, it’s become part of Rockbrook’s overall program. Rafting is popular, of course, because it’s really fun for the girls. They have an absolute blast rocking and bumping down the river, splashing and being splashed by the cold water, chatting a singing along the way, and laughing hysterically whenever someone falls out of the boat (which happens quite a bit… often intentionally, or at least partly so). 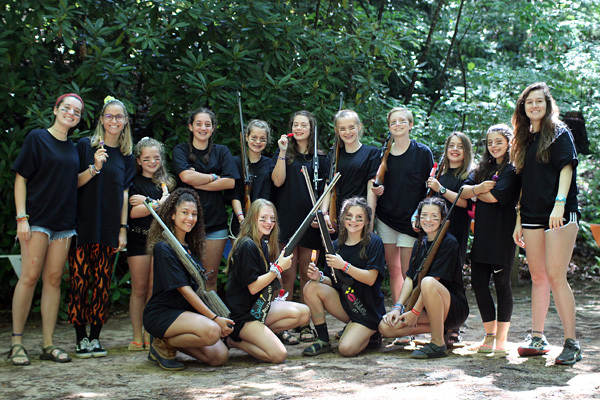 Rockbrook is the only girls’ camp that has a US Forest service permit to raft the Nantahala, so we can use our own equipment and as guides, our own adventure staff as who are familiar to the girls. 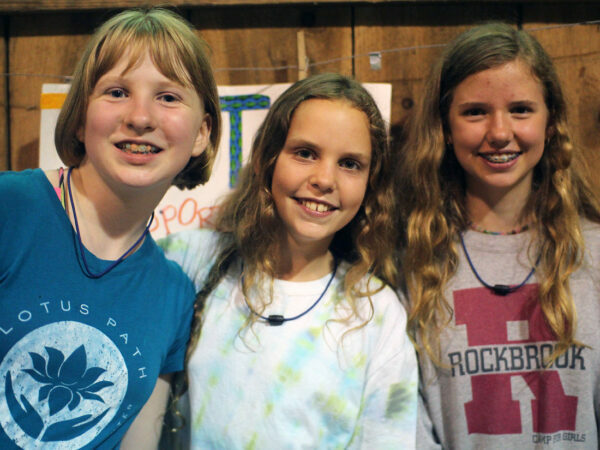 For us there’s no stranger in your boat, just someone you see around camp ordinarily, and that’s really nice for the girls. It was a beautiful, sunny, warm day on the river for all 57 people (plus our 6 guides) who took their trips today. 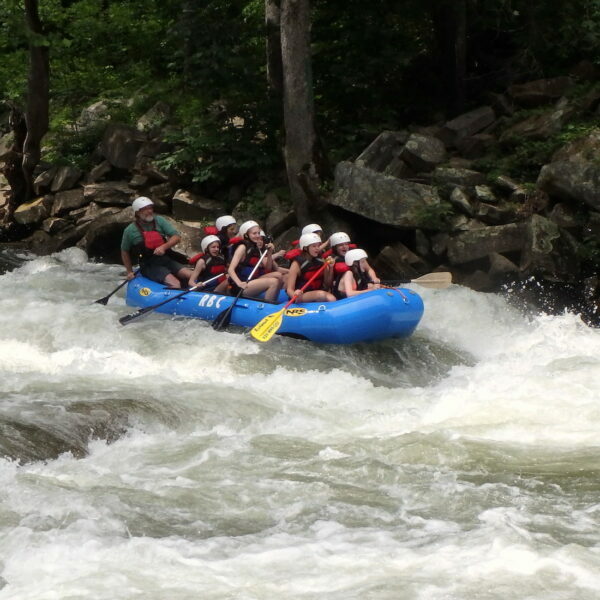 The first rafting day of the summer was an excellent success. 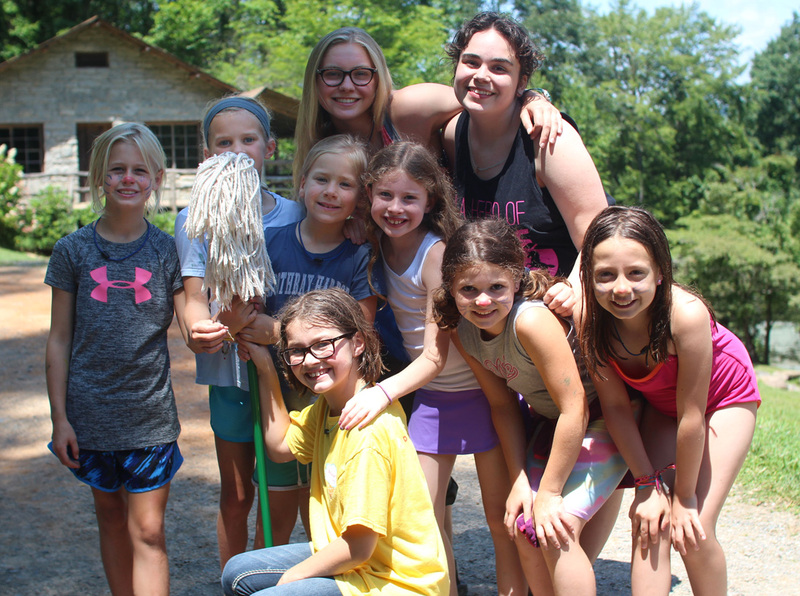 If you don’t know about “Muffin Break,” let me describe it because it also has become an important feature of camp life at Rockbrook. It’s essentially a yummy surprise for the girls each morning provided by one of the bakers in the kitchen, a freshly-baked muffin served as a snack between the first and second activity periods (about 11am). The muffin flavors are different everyday, ranging from traditional varieties like chocolate chip and cinnamon crumble, but often have an added twist. For example, we’ve seen pumpkin chocolate chip, key lime pie, white chocolate strawberry, and even zucchini sprinkles. Today was another new flavor, maple pancake. The muffins were reminiscent of pancakes, and sure enough, included a drizzle of maple syrup on the top making them sweet and sticky, and fun to eat. The next time you send a letter or email to you daughter, you might ask her about the muffins and if she’s had a favorite flavor so far. On the wall in the dining hall, right up front where everyone can see it, is something we call “The Wheel (of FUN! ).” Somewhat like the game show “Wheel of Fortune,” our wheel spins and clicks around until stopping on a random section where we’ve indicated fun activities that the lucky spinner wins. You can see these prizes in the photo above, but they are designed for an entire cabin to enjoy and include things like “Rest Hour at the Lake,” “Polar Bear” (an early morning, before breakfast, jump in the lake), Dance Break (picking a song to blast during a meal where everyone stops to get up, sing and dance for a couple of minutes), and “Dress a Director,” for example. Though not every time, we often spin the wheel during the lunch announcements. 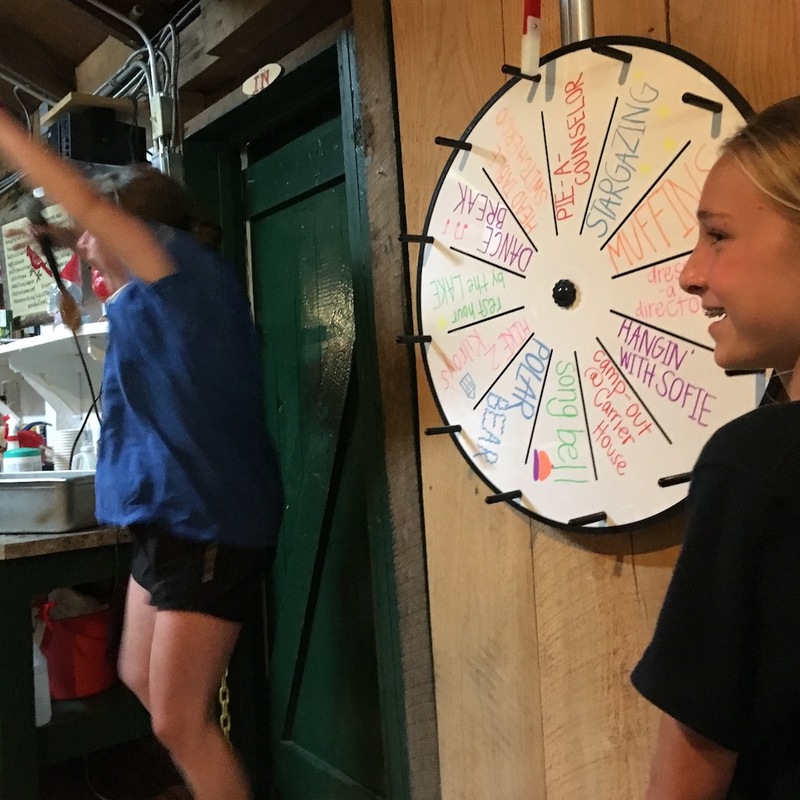 Selecting which camper gets to spin the wheel is a big part of the fun. Chase hops on the mic and has everyone stand up, and then by announcing random qualities, narrows down the crowd. She might say, “Stay standing if you have your hair in a pony tail” and those without pony tails will sit down. 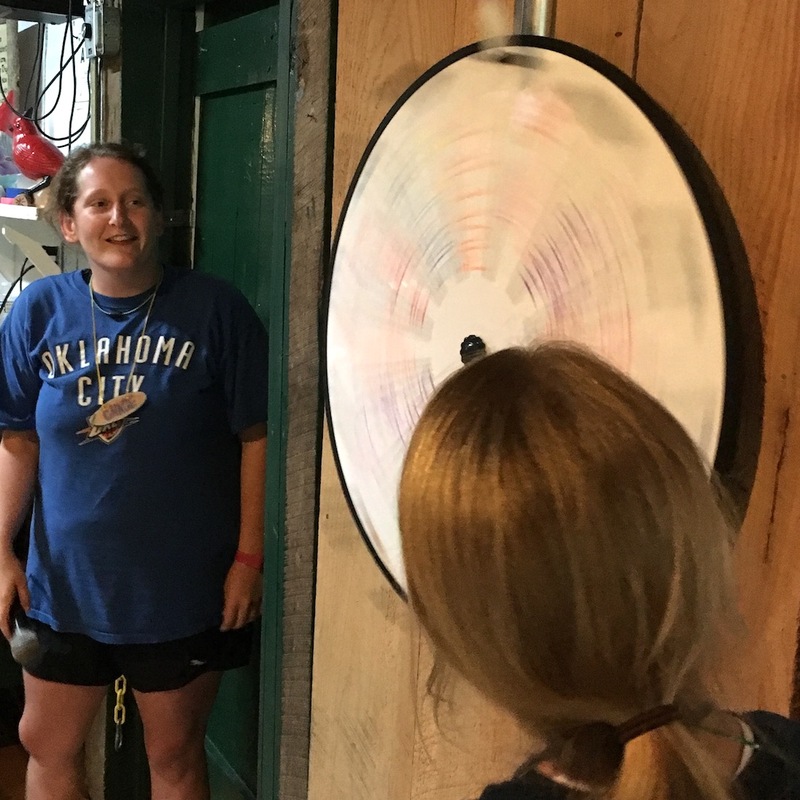 Then, “Stay standing if you’ve made a friendship bracelet,” or “Stay standing if you have a brother.” As the excitement builds to almost explosive levels, this process continues until only one person remains standing, our wheel spinner. Today that person was Alden and her spin landed on “Pie a Counselor,” which to everyone’s hilarious delight (well, maybe not so much the counselor) happened after dinner. Speaking of dinner, tonight’s had a theme: Nickelodeon. 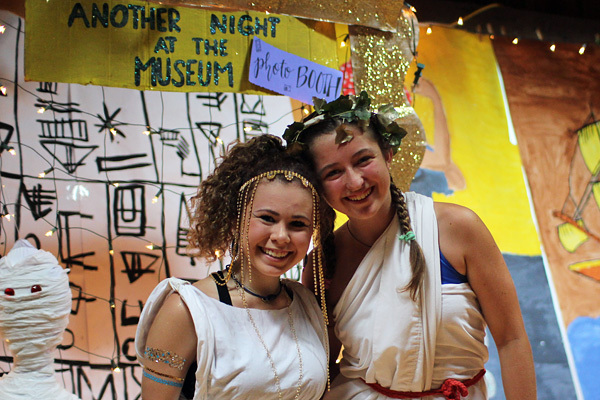 The counselors set up the dining hall to play several Nickelodeon-inspired games throughout the meal. First, they surprised the girls by revealing that every chair had a colored “splat” hidden underneath, and that each color indicated they won a small prize, like a jump rope, silly putty, or crazy fidget sticks. The main event though was a game of musical chairs where the counselors roamed about while music (a Nickelodeon theme song, of course!) played, and sat down at a different cabin’s table then the music stopped. 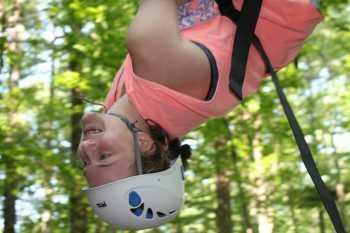 It was a fun way for the campers to get to know other counselors. For dessert, the kitchen made green “slime” glaze for each table to “slime” it’s own chocolate cake. A little messy and a lot of yummy. After dinner the games continued out on the hill. 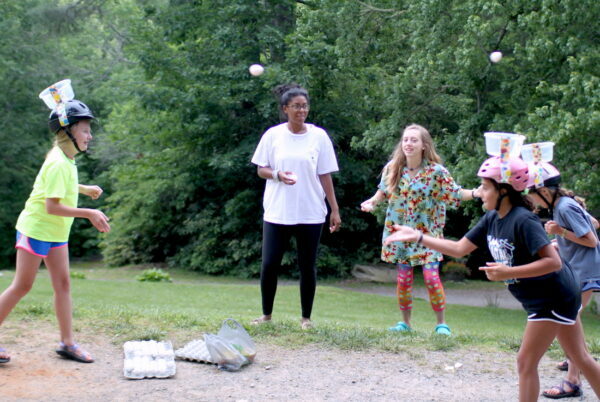 Again inspired by Nickelodeon, the girls tried an egg toss where they had to catch the egg in a pail taped to a helmet. Like the Nickelodeon game show “Double Dare,” other groups had a challenge to use only their feet to remove a banana from a tub filled with different types of canned food like cherry pie filling, jello, and sliced beets. I think you can understand why we held these games outside! Sure they were a little gross, but the girls loved playing like this— small physical challenges, silly costumes, messy consequences, with cheering each other all the while. 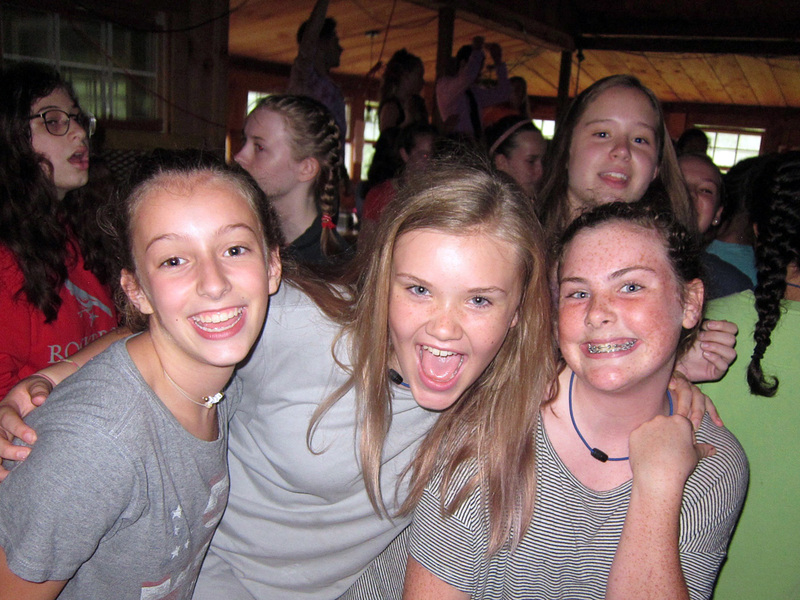 It was one of those wonderful camp moments of full exuberance and laughter that is very difficult to find anywhere else. The Rockbrook zip line and swinging bridge is a special camp activity we offer like other adventure trips (e.g., backpacking, kayaking, and canoeing). The girls sign up for it whenever it’s announced in the dining hall, like today after breakfast. This means skipping one of their regularly scheduled activities, but riding the zip is such a thrill, almost everyone does it at least once while they’re here. The girls meet the instructors at “Hiker’s Rock” to gear up with their harnesses, helmets, and special dual-wheeled pulleys. 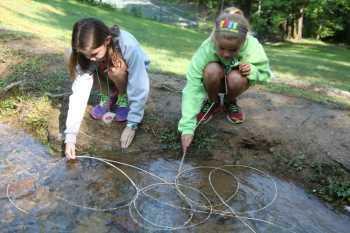 They then hike up into the woods behind the dining hall to the start of the swinging bridge. This is a 100-foot long suspension of steel cable, rope and wooden planks, hung between two huge boulders about 60-feet in the air. The bridge is challenging— some might say “scary” —because it wobbles as you walk on it, but also because we intentionally removed several of the planks leaving gaps to balance across. 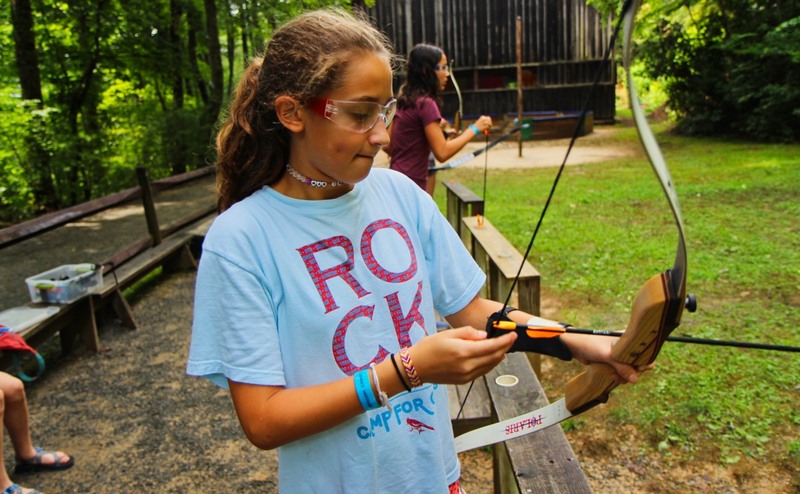 Once on the far side of the bridge, now perched high on a rock ledge, the girls take turns clipping their pulley into the 450-foot long cable that stretches across the camp, passing in front our new office building and ending on a wooden platform. It takes some courage to step off the ledge, but as the girls feel the ride’s acceleration, they’re immediately smiling, often screaming, and having a great time. 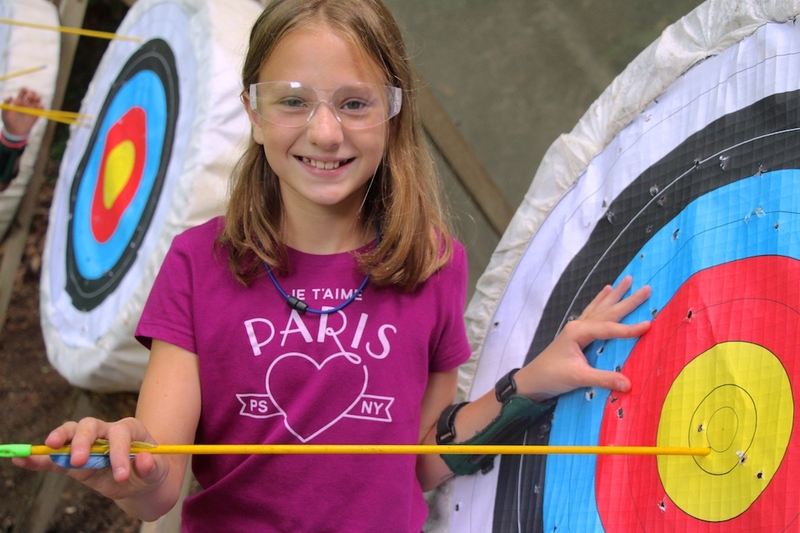 On the flat area near the gym, the archery instructors have been helping girls improve their shooting techniques. 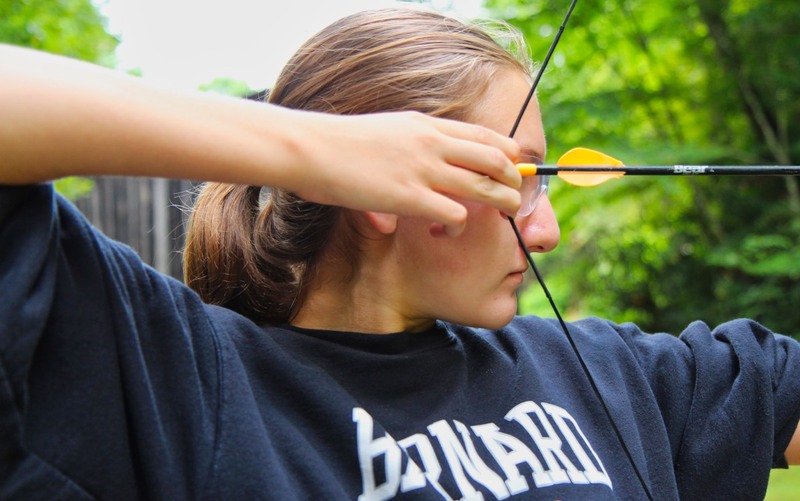 There are a few safety rules on the archery range to learn first (e.g., the shooting commands), but then there are tips about how to stand, to draw and hold the bow, to aim, and to release. 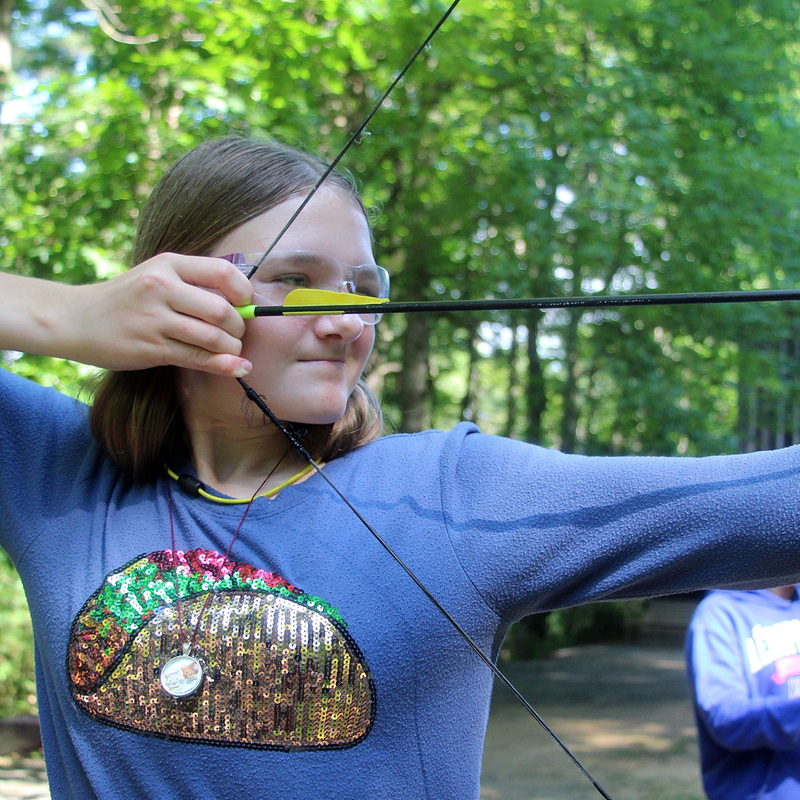 Archery requires proper balance, breathing and concentration too, so the girls have plenty to work on! 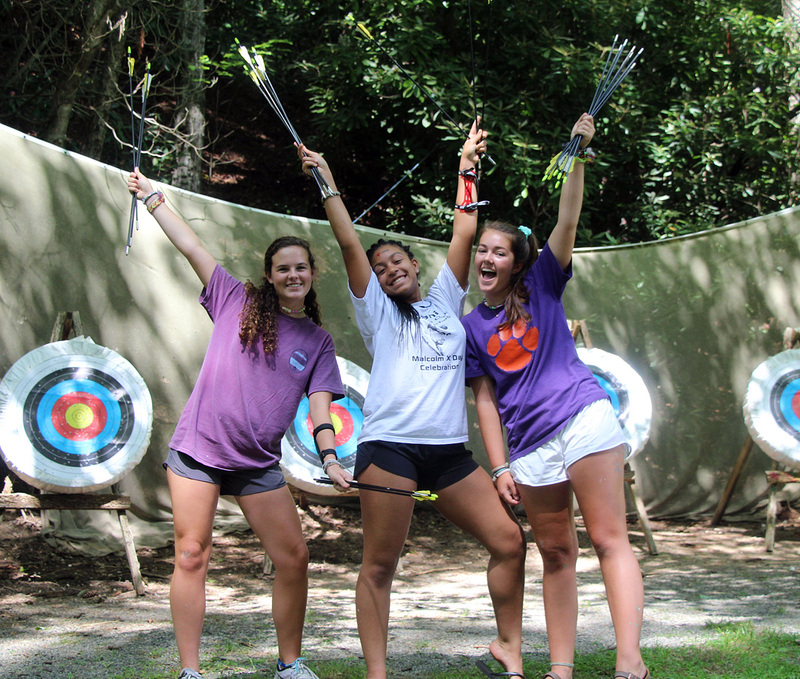 It’s exciting when someone gets a bullseye and thereby has her name announced at lunch as joining the “bullseye club.” These girls are really getting good! 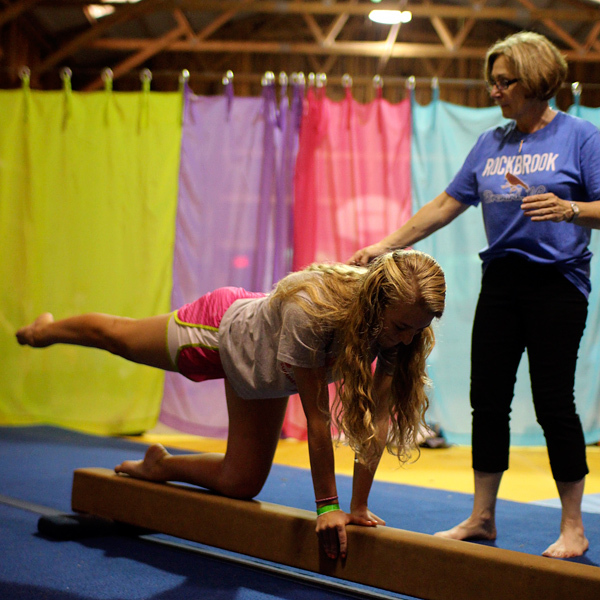 Meanwhile, nearby inside the gym, Elaine Trozzo our longtime gymnastics coach has been working with the girls on the balance beams, both the high beam and low beam depending on the skill she’s teaching. She’s going over basic walking techniques with the beginners, but also helping a few girls improve their jumps, turns and dismounts. 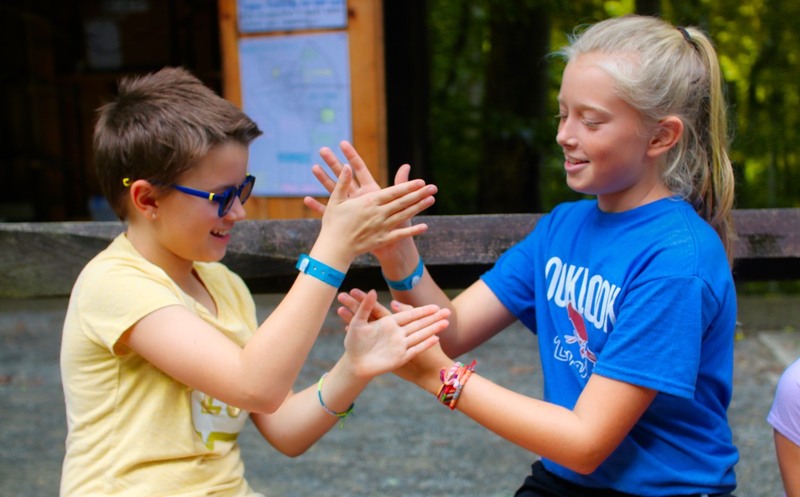 Elaine does a great job keeping her classes fun and informative by combining drills and games. She always begins with a few minutes of stretching to warm up, and lately has been finishing with runs on the mini tramp with girls taking turns doing tricks like flips and tucks onto the landing pads. It’s nice to think how the skills developed in gymnastics— strength, balance, and flexibility, for example — easily translate to other physical activities and sports. Like dancing… for, despite a passing band of rainy weather after dinner, tonight we were all excited to dance with the boys of Camp Carolina. 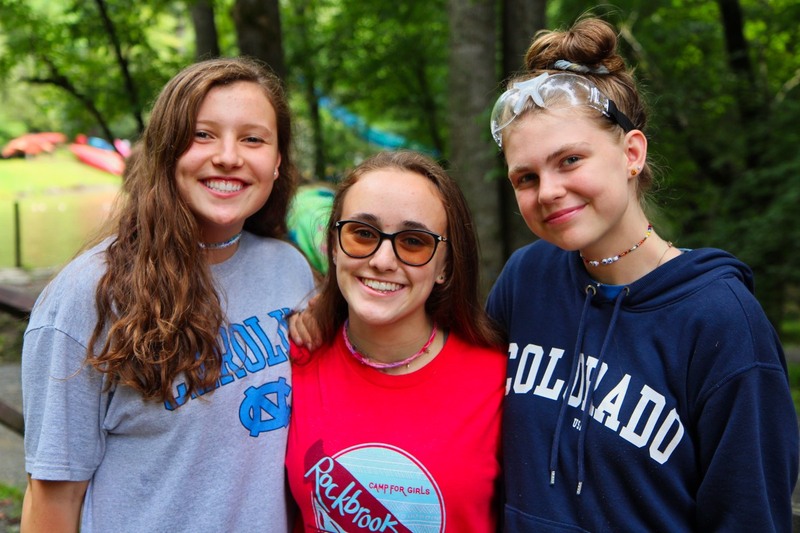 We actually held two dances, the Juniors and Middlers staying here in the Rockbrook gym, and our Seniors loading up eight buses and vans to make the trip over to Camp Carolina’s dining hall for their dance. We also offered an alternative activity for those girls who thought dancing wasn’t their thing tonight. These dances are fun for the girls because they are mostly about jumping around with each other, being silly and singing to the music. The boys are almost simply a backdrop (though perhaps less so for the oldest girls). 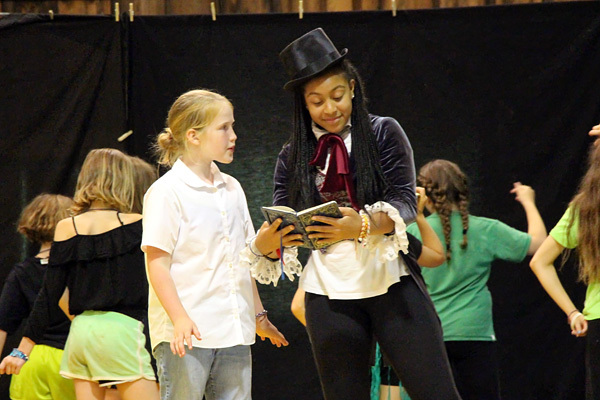 Several of the more popular songs have well-known choreographed group dance moves like the “Cha Cha Slide,” or even that classic, “YMCA.” Overall, this evening was a chance to dress up a little, maybe get your hair “just right,” and enjoy a night of playful dancing.